To prevent dirt, dust and mud from clogging up the shock absorber it can be dressed up with Öhlins shock covers. The flexible neoprene material is an effective blocker and it fits many different shock absorber types. This shock cover fits the Öhlins single tube 36 as well as the TTX30 for most ATV´s and snowmobiles, with an outer diameter up to approximately 75 mm. 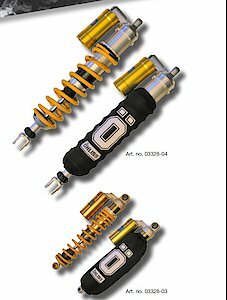 Please note: These covers can raise the temperature of the shock absorber. For long duration Off-road use we recommend not using these covers!